Week two of Wild Card Wednesday challenges using the March kit from SCRAPTURES. 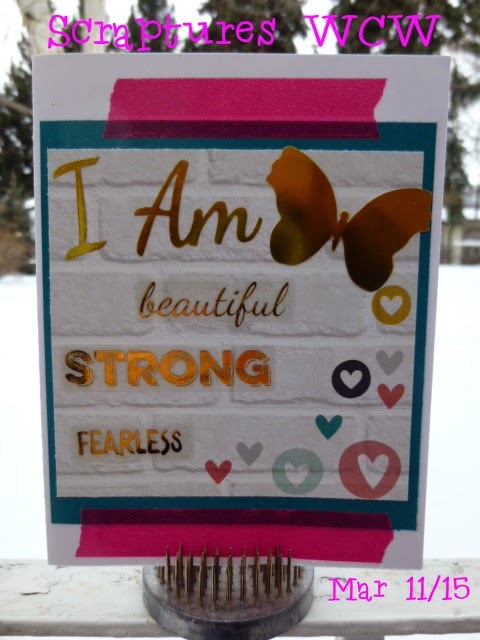 This month's kit features the "I AM" collection by Simple Stories. Remember, the challenge for this month is to make cards with NO STAMPS, just the embellishments that came with the kit...you can do it...I know you can!!! I thought the gold embellishments in the kit were so pretty with some of the brighter colours. I added a few pieces of pink washi tape to add a little additional colour.